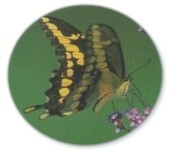 Butterfly counts are carried out in a similar fashion to Christmas Bird Counts using a count circle fifteen miles (24 km) in diameter. Counts are sponsored by the North American Butterfly Association. The count circle includes Windsor, LaSalle, the lower portion of the Canard River, McGregor, Maidstone and Tecumseh. 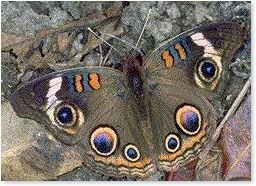 Field observers pay a small fee to participate and attempt to count every individual butterfly encountered. Garden watchers, backyard observers and children under 12 can take part for free. Join us on Saturday, July 3, 1999 for next year's count. This year 30 participants found 1,243 butterflies of 49 species. The Ojibway Prairie Complex received the majority of coverage. David D'hondt's group covered Black Oak Heritage Park. Paul Pratt led at Spring Garden Prairie ANSI. Karen Cedar led in Ojibway and Tallgrass Prairie Parks. Brenda and Ben Kulon searched Ojibway Prairie Provincial Nature Reserve, and Jeff Larson covered the LaSalle Woodlot ESA and Spring Garden. David and Fox D'hondt visited the Little River area and Glenn Gervais took a group to McCauliffe Woods Conservation Area. The count was hosted by the Ojibway Nature Centre, Windsor Parks & Recreation. The Friends of Ojibway Prairie sponsored a picnic lunch which was provided by Deb Waugh. Windsor experienced a very early spring this year and many flowering plants bloomed two weeks earlier than normal. This year most early summer butterflies had finished flying by the time of the count and many species more typical of mid July were on the wing. Rain and cloud cover reduced the count for many individuals this year. Little Yellow, Baltimore Checkerspot and Eastern Comma were observed during count week only. Broad-winged Skipper was recorded for the first time this year. 64 species have been recorded over the past five butterfly counts. Last year 34 counts were held in Canada and 301 counts in the rest of North America. Windsor reported the highest total for Canada with 50 species. We also recorded the highest count (217) for Silvery Checkerspot in North America. Click here for the complete results. Maurice Bottes, Margaret Calder, Suzan Campbell, Karen Cedar, Cathy Crowell, Paul Desjardins, David D'hondt, Fox D'hondt, Alex Gervais, Glenn Gervais, Zack Gervais, Astrid Goodger, Barb Hayes, Merv Hayes, Josie Hazen, June Hurley, Tom Hurst, Erik Kociuk, McKala Kociuk, Ben Kulon, Brenda Kulon, Jeff Larson, Carl Maiolani, Chris Maiolani, Margaret McDonald, Larry Onysko, Paul Pratt, Juliet Renaud, Fred Urie, Deb Waugh.